FOR hundreds of years wooden ships have been built on the East Coast, using methods which have stood the test of time. Until the second half of the twentieth century many shipyards were still employing techniques which had been used on Henry VIII's Mary Rose and on the Pilgrim Fathers' Mayflower. 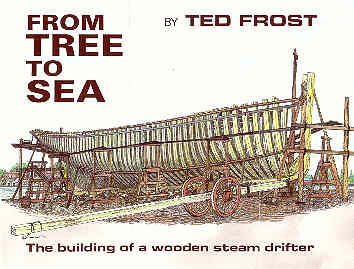 In From Tree to Sea Ted Frost, who was apprenticed as a shipwright in 1916, tells in detail with the aid of his own incomparable drawings how a wooden fishing boat was built in one particular yard at the time he began to learn his trade. It is a book which will be of great interest to all who study the history of ships, but it is also much more than a treatise on wooden shipbuilding, for the author has made it also a very human story telling of the lives of the shipwrights and others employed on John Chambers' No. 3 Yard at Oulton Broad. It is a story told with humour and great affection. "Young Ted," as he was known to his workmates, began his apprenticeship the day after the bombardment of Lowestoft by a squadron of German battle-cruisers; typically he refers to that as "a good send-off'. And his years as an apprentice were, he says, "almost seven years of happiness". Ted Frost's enthusiasm for the shipwright's work comes through in his text and also finds expression in some two hundred superb drawings, many of which are reproduced full-page.